Daim prefers to take graffiti in an unusual direction. It seems as if the four letters of his name jump off the walls, explode onto canvases, explore natural environments, and come to life as sculptures. He has a wide range of artistic motives that include constantly exploring new media. After studying fine art in Switzerland, Daim reinvented his name using an orchestra of new techniques, such as etchings, linoleum prints, and sculptures of wood and concrete. The works of Van Gogh and Frank Gehry inspire him; but Daim’s true inspiration lies within nature, with its extensive variety of shapes, colors, and patterns. Daim had a hand in painting the tallest graffiti in the world, commemorated in the Guinness Book of Records. He is a member of international artist collectives such as FX, FBI, SUK, and GBF, and has become one of the most famous and sought-after graffiti artists in the world. He is invited to participate in art shows and exhibitions around the world and has collectors in Japan, New Zealand, Australia, and the United States, as well as in Europe. In 1999 Daim co-founded the artist association “Getting-Up”. 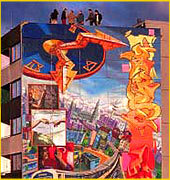 Starting in 2000 they organized the very successful annual Urban Discipline exhibition in which international graffiti artists presented their work to a wide public audience in Hamburg, Germany. Visit www.daim.org for more info.